Opera VPN is free. But is it worth it? Read on to find out more. Opera VPN is a VPN service that comes preinstalled on the Opera browser. And that means, it will have a specific set of features and restrictions that you may or may not like. The one thing that works for Opera VPN from the start is that it has a ton of user base. In other words, Opera browser is the fifth most used web browser in the world. Regardless of the fact that each user of Opera browser probably won’t use Opera VPN, even if a mere ten percent of Opera browser users make use of Opera VPN, then Opera VPN sits pretty good with a huge number of users. Of course, Opera itself will not make any money from all those users because Opera VPN is free. There is the other reality that nothing in the real world comes for free. In other words, free services always have something they don’t want to advertise. And that’s what we’ll try and find out in this Opera VPN review. So first things first, Opera VPN will only work with Opera web browser. Some of us would think that this was obvious but trust us. In a world where Opera users can install Chrome extensions to Opera, we have to make sure we are as crystal clear about our Opera VPN review as possible. So again, Opera VPN doesn’t work with any other browser than Opera. Granted, Opera isn’t exactly near CHrome when it comes to the user base and/or quality and/or features. But it does have a small user base that is extremely loyal to the browser. Opera is perhaps the only browser that is closest to making a dent in Chrome’s monopoly in the web browser market. But Opera, on its own, packs a punch as well. It has some cutting edge technologies that make Opera web browser a useful one. Opera has also pioneered many other web browser features which give it the edge over all other browsers except Firefox, Chrome, and Edge. Opera web browser comes with features such as Opera Turbo. This is a feature that makes use of a compression technology that is specifically designed to make the user’s web browsing experience faster. Opera web browser also comes with a built-in ad blocking feature. All of this ensures that Opera can perform the base functions very well. And all the while, it uses way fewer resources than Google Chrome. So how come Opera has a free VPN feature and Chrome doesn’t? Well, first of all, we have heard some solid rumors that Chrome is working on a free VPN service of its own. Secondly, Opera has stolen the march on all web browsers by acquiring SurfEasy. Most of us know that SurfEasy is a Canadian VPN service. Opera acquired it about two years ago. Moreover, the company introduced the free VPN feature about a year ago. The point of acquiring a VPN service is precisely that Opera has the perfect tool for it in the form of a web browser. But Opera has gone one step further this time around. It is offering the VPN service for free. NO matter how good or bad the free VPN service is, it is sure to attract a lot of users away from Firefox and Edge. 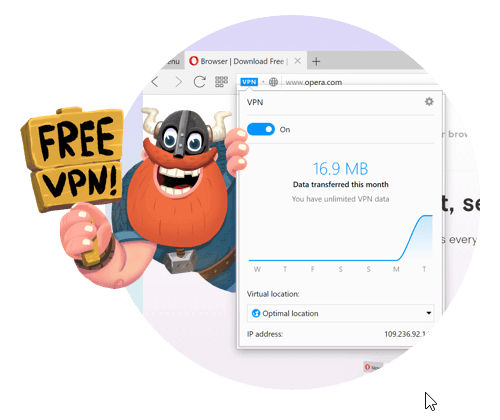 What we do know is that there is no surprise in the fact that Opera has come up with a free VPN service for its flagship web browser. 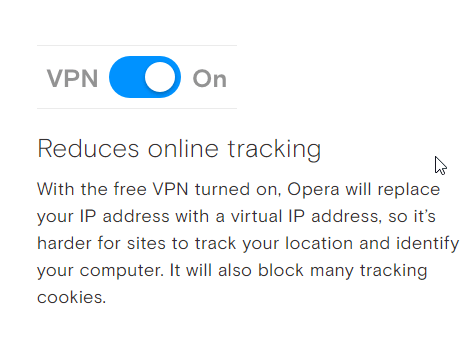 The free VPN technology comes integrated right into the Opera browser as soon as you install it on your computer machine. Steve Kelly, who is the Vice President of Marketing at Opera, recently said in an interview that the primary reason why the company wanted to incorporate a VPN service with its web browser is that Opera wanted to make sure that it protected user security and privacy properly. He also said that everyone in the online world deserved to surf the internet in a private manner if they chose to do so. Furthermore, Steve said, some factors had made it quite difficult for modern online users to maintain their privacy while they surf the web. Kelly added that Opera had released an integrated VPN service which came with the browser for free and had unlimited data bandwidth. Opera is perhaps the only web browser that offers a VPN service for free and without any data restrictions. Steve said that the company wanted to make it plain and simple for online users to enhance their anonymity and privacy. Moreover, the company also wanted to make sure that people had access to all the content they wanted to have access to. As we all know, VPN service providers do exactly that. They provide access to blocked content the world over. As mentioned before, Opera VPN service only works with the Opera browser. But Opera has released the same VPN service, for free, on other platforms as well. We are happy to report that Opera VPN apps are indeed true VPN applications. In other words, they really encrypt your online traffic and protect your internet connection. AS mentioned before, Opera VPN for the Opera web browser is absolutely, one hundred percent, free. The company does not charge you anything for its VPN technology. Of course, the free VPN service does come only as a bundled feature with the Opera web browser. We have already indicated the fact that the company has set no data limits on its VPN feature. And this fact alone makes Opera VPN worth your consideration. In fact, Opera VPN might rank as the most generous VPN service provider when it comes to free services. We don’t know of many VPN service providers that offer their VPN services for free and without any data limits. The only other good VPN service that comes to mind is Browsec. But how long can Opera sustain the pressure? Of course, when anything is free, it is bound to attract a lot of users. And when you have a lot of users as a VPN service, you have to make sure you have enough high-quality servers to handle all the traffic. Opera is still offering the VPN service as a free add-on to its web browser. But eventually, it will have to start to charge people for using its VPN service. That’s just the nature of all online business. And we can’t say when or where Opera will start to charge for its free VPN service. In fact, we think that our guess would be probably as good as anyone else’s. Since Opera VPN is a free VPN service provider, don’t expect it to have a ton of servers and then a ton of locations for those servers. The fact that it is a completely free VPN service is alone enough if we look at what’s happening in the VPN industry at the moment. With that said, let’s take a look at what Opera gives you with its VPN service (for free). As we have mentioned before, the list of countries is indeed limited. But you can’t expect a free VPN service provider to compete with paid and commercial VPN service providers in terms of features and depth of those features. We’ll reiterate the point that Opera VPN is free. And when you use something for free, you really don’t have much choice as to what you get. Neither should you expect a free VPN service provider to compete in each and every department with some of the top VPN service providers in the industry. The best we can say about these locations is that Opera VPN has put in the work. In other words, these locations are considered as premium locations for VPN servers. Of course, Opera VPN could have scored even more points had it offered VPN servers in the UK. We are actually surprised as to why it didn’t include the UK as a VPN server location. Surely, more people want to connect to VPN servers in the UK than to VPN servers in Singapore and Canada combined. No UK VPN Server. What Does That Mean? That means, if you want to watch BBC iPlayer with Opera VPN then you can’t. Since you can’t change your IP address to a UK one, this means you can’t spoof your location to the UK. And when you can’t change your location to the UK, you can’t use BBC iPlayer. What About Netflix? Does Opera VPN Work With Netflix? Unfortunately, no Opera VPN does not work with Netflix. So if you wanted a VPN service provider that worked with US Netflix, then Opera VPN isn’t for you. You’re better off looking at some premium and commercial VPN service providers like StrongVPN if you want to make sure that you always connected to US Netflix whenever you want to. Do take note that you can access US Netflix website with Opera VPN. You just won’t have the opportunity to view any content because Netflix will block you. Netflix will also show you a message that would say something like “you are running a proxy”. There isn’t a whole a lot of information available when it comes to the encryption technology that Opera VPN uses. What you need to know is that even if a VPN service is free and has the greatest features on earth, if it doesn’t make sure that it has great encryption, it is worth nothing. If a VPN service truly wants to do what a VPN service is supposed to do then t has to provide all its users with the best encryption technologies. Our research for this Opera VPN review tells us that Opera using the AES-256 bit encryption technology. Of course, the AES-256 bit encryption technology has a good reputation in the industry. But we need more information regarding how Opera implements it in order to pass a judgment. In other words, saying that a VPN service uses AES-256 bit encryption technology doesn’t say much. As mentioned before, there is no doubt about the fact that AES-256 bit encryption technology is excellent. But details make all the difference in the VPN industry. Our research for this Opera VPN review tells us that there is a high probability that Opera VPN uses the OpenVPN cipher. Of course, we can’t confirm this since there is very little information on the subject matter. There are lots of other areas regarding the details of the encryption technologies that Opera VPN chooses to hide. We, and probably everybody else too, know nothing. 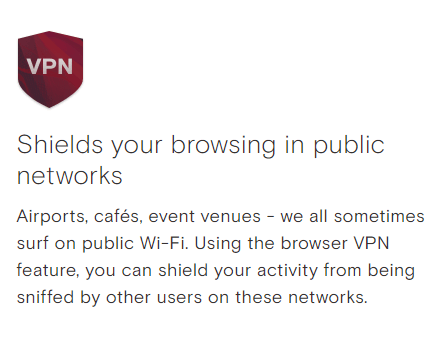 Of course, you can search the internet for what those terms mean but you won’t find how Opera VPN makes use of them. Again, no one really has much information on whether Opera VPN keeps logs or not. Or if the company keeps logs then what is the extent of those logs. This document says that the SurfEasy VPN service does not keep/store original IP addresses of its users when these users connect to the company’s VPN service. Therefore, SurfEasy can’t identify its users when these users take the IP addresses of the company’s VPN servers. Because SurfEasy itself doesn’t have that information since it doesn’t store any. But there are some exceptions as we will explain in a bit. The most important point that you need to take note of here is that SurfEasy says that the company might make use of in-app analytics online technologies such as Google Analytics. The company also says that it may do that in order to simplify and improve the overall VPN app, its design and of course, the actual VPN service. The only thing we can say is that we have to some optimism. Opera as a software company is based in the country of Norway. As mentioned before SurfEasy is based in Canada. Since these are two different countries, they are bound to have different digital laws. For example, Norway is known as a country that has some strict data laws. But its government agencies make sure that those data laws aren’t unbearable for businesses and users. In other words, government agencies in Norway do perform surveillance activities. These government agencies also cooperate with the likes of the NSA. Many media outlets have reported on this issue as well. But comparing Norway’s surveillance activities with some of the countries that are in Europe and the US itself, then we have to say that users have nothing to worry about. SurfEasy is based in Canada and that means that its VPN service is also subject to Canadian laws. Because Canada is a member of the Five Eyes Program. As we all know, NSA is the organization that leads the Five Eyes Program. The Five Eyes programs is basically a spying alliance which mainly consists of English speaking countries. Canada is also one of the handful of countries that is subject to that horrible Bill C-51. We won’t go into the details of what Bill C-51 is about but you should know that it is a part of the Anti-terrorism Act, 2015. If you live in Canada and want to use a VPN service over there then you should look for VPN services other than Opera VPN. Remember, the surveillance situation for each country is different. So one VPN service provider may provide great encryption and anonymity in one region but in another region. So you have to watch out for that. If someone forced us to form a list of countries which are suited to VPN service providers and then rank the countries in that list, then we will have to put Canada in the Poor category. And that’s what we want to tell you as well. There is a good chance that since SurfEasy is based in Canada, Opera VPN must also come under the same Canadian laws since Opera owns SurfEasy VPN service. We would like to remind you again that you are using a free VPN service when you are using Opera VPN. In other words, there is no such thing as a customer support when it comes to Opera VPN. Opera VPN doesn’t have that feature. Period. But, since it is so easy to use, and you don’t really have to set it up, you don’t need any customer support. Of course, there is always a chance that a user may get stuck. If you are one of those users, then you can access some form of help via Opera forums. Click here if you want to go there right now. As mentioned before, there is no installation process as such. To use Opera VPN, all you really need to do is to download the Opera Browser. And then install it on your computer system. First, install Opera on your computer machine and then run it. If you already have Opera browser installed on your computer machine and don’t see the VPN option, then that means your version of Opera browser is old. In other words, you need to update it. To do that, all you need to do is go to the official website and download the latest installer. Or, you can just go the About section of Opera and update Opera from there. Regardless, if you reinstall Opera, you will definitely see the Enable VPN option. The user interface is as minimal as it gets. Basically, there is very little in the way of a user interface. All you get is a small VPN button that appears on the left-hand side of the web browser’s URL or search bar. If you want to use the VPN service then all you need to do is click that VPN icon. After you have clicked the VPN icon, you should see the list of countries on offer. Then you have to select a VPN server location based on your preferences. After that, all you need to do is to click on the On button. The VPN button that appears on the left-hand side of the URL bar with go from orange to blue once Oprea VPN has successfully connected to a VPN server. Perhaps, this is a good time to mention that Opera VPN feature, in its appearance, looks strikingly similar to the old SurfEasy web browser extension. But of course, if you already know that Opera has bought SurfEasy, then this wouldn’t come has as a surprise to you. There are some differences though. The SurfEasy web browser extension had a 500MB data limit. As pointed out before as well, Opera VPN service is also available for other platforms such as iOS and Android devices. The only difference between the desktop version of Opera VPN and the smartphone version of Opera VPN is that the smartphone versions are actually fully fleshed out apps. The desktop version isn’t really an app, but just an advanced form of a web browser extension. That isn’t the case in the Android and iOS version though. The ANdroid app, from an appearance point of view, looks fantastic. It is slick and doesn’t bombard you with ads. But, sometimes you will face connection issues while trying to connect to a VPN server. In other words, we think that the Opera VPN Android App is a hit-and-miss affair. Sometimes, it works like a paid fast VPN service, other times it doesn’t connect. We have also noticed that sometimes it shows you that it has connected to a VPN server, but in reality, it hasn’t. That is particularly dangerous if you want to do something of a sensitive nature while thinking that you are connected to a VPN service when you actually aren’t. As you all know, the two most prominent features of the Opera web browser (desktop version) are ad-block and free VPN service. The mobile Opera apps are different though. The VPN in particular, brings all these features to the user’s entire iOS and/or Android device. Users need to know something important about mobile VPN apps. Mainly, that most of the times, these mobile VPN apps have to communicate with their developers. And these VPN apps do so via information exchange technologies. This basically makes a VPN service redundant. In other words, if your VPN service can communicate with its developers, then all the protection or geo-spoofing won’t actually work since there is always a guy or a team of guys who know everything about you. So how do you make sure that your VPN app is really doing the work? Well, there is no one way to ensure that. But, the best you can do is to use any company’s mobile VPN app, not via the actual app but via other online services such as web portals. In other words, don’t use apps to protect and hide your identity and data. Use web portal versions of known and well-reputed VPN services. Can You Torrent Using Opera VPN? Opera has specifically prohibited the use of Torrent technologies on its network. But since it is a free VPN service, we can’t really complain. Can You Use P2P File Transfer Technologies? Opera will block all P2P traffic if you try to use such technologies. Again, Opera VPN is free. You could have the greatest VPN service in the world in terms of features and security, but if it doesn’t have speed then it is partly useless. What’s the use of any online service if it slows down your web experience to a halt. There are many sites that you can visit and measure the speed your internet connection. And then repeat the process three to four times in order to average out the results. Our research for this Opera VPN review shows that Opera VPN is a pretty good VPN service when it comes to speed. And if you factor in the fact that Opera VPN is free, then the results are pretty impressive. The good news is that Opera VPN comes with a built-in feature for WebRTC leaks. The service performs DNS resolution via Google DNS servers that are located in the same location as the service’s VPN server that the user has connected to. So if you have connected to a VPN server that is located in the US, then US DNS servers will perform the DNS resolution. This setup is fantastic for users who want effective geo-spoofing. From Google’s perspective, all of the user DNS requests are made to appear to come from Opera VPN. Hence, the user’s real IP address is protected and secured. It is free. Absolutely, one hundred percent, free. 4 different VPN server locations. Opera, as a company, is based in Norway, which is acceptable. But SurfEasy is a Canadian company which is obviously not acceptable. Opera VPN probably keeps logs. Let’s drop the harsh critic act. Since Opera VPN is free, it doesn’t really have any negatives. But that may not suit every user on the planet. Of course, there is hardly an online user on earth who wouldn’t appreciate a free service. Opera VPN, which comes for free with the browser, is more than decent VPN service. But, it isn’t a full blown VPN service. It is closer to a good proxy service than a VPN service. But it is different from other free VPN service providers. First, it doesn’t have any bandwidth limit. People who only want to circumvent geo-restrictions, web censorships would appreciate Opera VPN. It does a reasonable job of changing your location and protecting your data while you browse the web. If can also protect you when you connect to insecure WiFI hotspot networks. However, users who want to make sure that their privacy is protected at all times will not find Opera VPN as a good solution. It is free, so what else can you expect? If you want to watch US Netflix then Opera VPN is not for you. then Opera VPN is not for you. Users who desire such features should probably look for commercial and paid VPN service providers. IPVanish is one of those VPN service providers. It is the highest ranked VPN service provider on our site. Click here to read the full IPVanish review right here and right now. Opera stable web browser for desktop now comes with a Free VPN feature. It is integrated within the browser so you don't have to install anything. But, Opera VPN isn't really a VPN service. It is more close to a proxy service. Why do we say that? Because true VPN services encrypt a user's entire online internet connection. Opera VPN only encrypts the user's internet data that moves to and from the web browser. Moreover, Opera VPN doesn't allow BitTorrent downloads. It doesn't give you anything outside the Opera web browser. It is free though and hence we can't complain about much. The review comes across as a pile of notes from a brainstorming session that was cobbled together without a proper edit. If you are referring to shorter sentences, then our research shows people find it easier to read and understand.